/ Do Havanese Have High or Low Energy Level? Do Havanese Have High or Low Energy Level? There are Havanese owners or potential future Havanese owners that want to know whether Havanese have high level of energy. I would say that this is a very good question to ask. Because that means either the existing Havanese owners are trying to revise their current lifestyle and schedule to adjust to their Havanese’s energy. That could also mean that the potential future owners are trying to figure out whether they can provide to their Havanese with the right amount of exercise they would need. Before I go on with all the details to explain the energy level of Havanese, I will just give you a simple and short answer to fulfill your curiosity first. Havanese have above average or quite high level of energy. That’s the amount of energy that is still easy to handle for you and also the amount that can make them cheerful to play with. Now, let me explain that in some more details and provide your with some additional interesting information. What exactly does it mean for Havanese to have above average level of energy? Let me explain it in a more practical way. That means that taking them for a 30-minute to 45-minute everyday should be able to make them very happy. They can certainly walk more or play more but that’s the rough level of exercise you should make sure that you can provide to your Havanese. I think that’s actually the perfect energy level since that’s the amount of exercise that you should have to keep yourself in shape too. Our recent culture just semi-force us to stick to having other form of activities like playing our smart phones, watching movies or television, or playing video games. In a way, you should thank your Havanese for keep you in shape. Trust me, it is hard to get in shape without your dog or other sort of motivation if you are no longer in your early 20s. In the previous paragraph, I was kind of suggesting that you should have a short walk that lasts for 30 to 45 minutes with your Havanese every single day. It is not that I don’t want to recommend you to take a longer walk. It is just that, for most people, it is impractical to ask for more. Indeed, I would say that if you can stick to the 30-minute walk for every single day routine, you are already a very, very good and responsible Havanese owner. I find it fun and practical to spend about 2 hours or a little more for hiking during the weekend though. It is actually something that you can look forward to once you discover the joy of looking for suitable hiking trails near your home. Although it seems like that you are using time that you used to spend on hanging out with friends or playing video games at first, you would soon find out that this is actually one of the best way for you to spend time in your weekend. Up to this point, my suggestion of doing a 30-minute walk daily should be a good guideline for you. 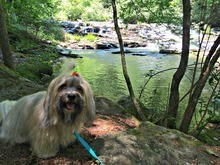 The weekend hiking is optional yet I don’t see why you wouldn’t want to make yourself and your Havanese more happy. I just want to know that if your Havanese is a puppy, you may need to do just a little more. You will have to adjust the amount of playtime or exercise time up until you can see that your Havanese behave normally at home. You may be wondering whether it is noticeable if you don’t play with your Havanese or walk with him for a couple of days. The answer is a definite “yes”. Say if you have to go to work for a 9-to-5 job and you have to leave your Havanese at home. Then you decide that you are too tried to play with your Havanese or to take a 30-minute walk with him. If that lasts for a few short days, you can see that your Havanese will have a super high energy and he will just mess around at your home. Simply put, if you don’t design playtime with your Havanese, he will eventually design his own. That’s not a good news for most people’s home. So, if you see that your Havanese does have super high level of energy at home, there is a good chance that you are not doing enough. Does Having High Energy Level Mean Havanese Bark a Lot? Some people may think that, since Havanese has relatively high level of energy, they bark a lot. That’s not true in the case of Havanese. Havanese don’t bark a lot or they can be categories as below-average barkers. They usually only bark when they walk pass other dogs, or when there are people pass by your home. Another trigger for their barking is when they want to play and want your attention. You can use that as your indicator to decide whether your Havanese want some extra playtime in addition to the 30-minute walk. To conclude this blog post, I would just like to spend a little bit of time writing about some common issues I have seen from different dog owners. Usually, when they get their new puppy home, they love them so much that it is not difficult for them to spend enough time to play or walk with their dogs for the first few weeks. After that, the excuses come. I have such a busy work day today. The weather is a little cold outside. My Havanese loves to watch TV. If these excuses do sound familiar to you, make sure you remind yourself that it is your responsibility to take of your dog and make your dog happy. You did choose to have him and he didn’t choose to have you. You should learn to enjoy the playtime with your Havanese.